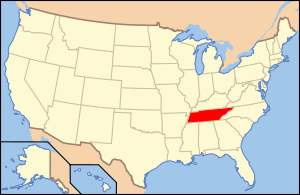 Map of the United States with Tennessee highlighted. Tennessee was one of the most divided states in the country at the outset of the war. Before the bombardment of Fort Sumter, Tennessee was staunchly pro-Union, though there were still a few secessionist hot beds in the western and middle portion of the state. The situation rapidly changed when Fort Sumter was bombarded and Lincoln made the call for 75,000 volunteers to suppress the rebellion. Tennesseans saw this as a threat to their "southern brethren," and though Tennessee voted to secede, there were still areas scattered all over state that had strong Union sympathies. The areas Unionism was most prominent were in the hills overlooking the west bank of the Tennessee River in the western part of the state, and in the rough mountains to the east. In fact, Tennessee would furnish more troops for the Union than every other Confederate state, combined. Tennesseans fought heavily on both sides of the war, and were present at General Robert E. Lee's surrender at Appomattox Court House in 1865. In the June 8, 1861 referendum, East Tennessee held firm against separation, while West Tennessee returned an equally heavy majority in favor. The deciding vote came in Middle Tennessee, which went from 51 percent against secession in February to 88 percent in favor in June. Having ratified by popular vote its connection with the fledgling Confederacy, Tennessee became the last state to declare formally its withdrawal from the Union. Control of the Cumberland and Tennessee Rivers was important in gaining control of Tennessee during the age of steamboats. Tennessee relied on northbound riverboats to receive staple commodities from the Cumberland and Tennessee valleys. The idea of using the rivers to breach the Confederate defense line in the West was well known by the end of 1861; Union gunboats had been scanning Confederate fort-building on the twin rivers for months before the campaign. Ulysses S. Grant and the United States Navy captured control of the Cumberland and Tennessee Rivers in February 1862 and held off the Confederate counterattack at Shiloh in April of the same year. Capture of Memphis and Nashville gave the Union control of the Western and Middle sections. Control was confirmed at the battle of Murfreesboro in early January 1863. After Nashville was captured (the first Confederate state capitol to fall) Andrew Johnson, an East Tennessean from Greeneville, was appointed military governor of the state by Lincoln. During this time, the military government abolished slavery (but with questionable legality). The Confederates continued to hold East Tennessee despite the strength of Unionist sentiment there, with the exception of strongly pro-Confederate Sullivan and Rhea Counties. TN House of Rep. & Brig. Gen.
Rear Adm. & Brig. Gen.
U.S. House of Rep. & Lt. Col.
East Tennessee was a stronghold of Unionism; most slaves were house servants—luxuries—rather than the base of plantation operations. The dominant mood strongly opposed secession. Tennesseans representing twenty-six East Tennessee counties met twice in Greeneville and Knoxville and agreed to secede from Tennessee (see East Tennessee Convention of 1861.) They petitioned the state legislature in Nashville, which denied their request to secede and sent Confederate troops under Felix Zollicoffer to occupy East Tennessee and prevent secession. The region thus came under Confederate control from 1861 to 1863. Nevertheless East Tennessee supplied significant numbers of troops to the Federal army. (See also Nickajack). Many East Tennesseans engaged in guerrilla warfare against state authorities by burning bridges, cutting telegraph wires, and spying for the North. East Tennessee became an early base for the Republican Party in the South. Strong support for the Union challenged the Confederate commanders who controlled East Tennessee for most of the war. Generals Felix K. Zollicoffer, Edmund Kirby Smith, and Sam Jones oscillated between harsh measures and conciliatory gestures to gain support, but had little success whether they arrested hundreds of Unionist leaders or allowed men to escape the Confederate draft. Union forces finally captured the region in 1863. General William Sherman's famous March to the Sea saw him personally escorted by the 1st Alabama Cavalry Regiment, which consisted entirely of Unionist southerners. Despite its name, the regiment consisted largely of men from Tennessee. After the war, Tennessee adopted a constitutional amendment forbidding human property on February 22, 1865;   ratified the Fourteenth Amendment to the United States Constitution on July 18, 1866; and was the first state readmitted to the Union on July 24, 1866. Because it ratified the Fourteenth Amendment, Tennessee was the only state that seceded from the Union that did not have a military governor during Reconstruction. This did not placate those unhappy with the Confederate defeat. Many white Tennesseans resisted efforts to expand suffrage and other civil rights to the freedmen. For generations white Tennesseans had been raised to believe that slavery was justified. Some could not accept that their former slaves were now equal under the law. When the state Supreme Court upheld the constitutionality of African American suffrage in 1867, the reaction became stronger. The Nashville Republican Banner on January 4, 1868, published an editorial calling for a revolutionary movement of white Southerners to unseat the one-party state rule imposed by the Republican Party and restore the legal inferiority of the region's black population. ^ "American Civil War Research Database". www.civilwardata.com. Retrieved April 3, 2018. ^ "Tennessee 4 Me -". www.tn4me.org. Retrieved April 3, 2018. ^ "Tennessee Civil War GIS Interactive Map - Tennessee Secretary of State". sos.tn.gov. Retrieved April 3, 2018. ^ "The Effect" (PDF). Nashville Daily Gazette. 5 January 1861. Retrieved February 17, 2014. ^ "Pro-secessionist proposal to construct a fort at Randolph, Tennessee, on the Mississippi River" (PDF). Memphis Appeal. 20 January 1861. Retrieved 17 February 2014. ^ White, Robert D. "Messages of the Governors of Tennessee, 1859-1869, Vol. 5, pp.255-269; Excerpts from Governor Isham G. Harris' Legislative Message" (PDF). Retrieved 17 February 2014. ^ "The Tennessee Convention" (PDF). Nashville Daily Gazette. 2 February 1861. Retrieved 17 February 2014. ^ "Read the Treasonous Circular!" (PDF). Knoxville Whig. 3 February 1861. Retrieved 17 February 2014. ^ "Another Political Demonstration—Minute Men Torchlight Procession" (PDF). Memphis "Daily Argus". 8 February 1861. Retrieved 17 February 2014. ^ "Secession Demonstration and Ball in Memphis" (PDF). Memphis "Appeal". 9 February 1861. Retrieved 17 February 2014. ^ "TENNESSEANS, DECIDE FOR TENNESSEE" (PDF). Memphis Daily Argus. 8 February 1861. Retrieved 17 February 2014. ^ "THE CONVENTION" (PDF). Memphis Daily Argus. 9 February 1861. Retrieved 17 February 2014. ^ White, Robert D. "Messages of the Governors of Tennessee, op cit. p.272: The vote against secession, and against 'Convention' or 'No Convention'" (PDF). Retrieved 17 February 2014. ^ "Display of Flags" (PDF). Nashville Daily Gazette. 9 February 1861. Retrieved 17 February 2014. ^ "Jovial" (PDF). Nashville Daily Gazette. 10 February 1861. Retrieved 17 February 2014. ^ "About Clarksville Jeffersonian. (Clarksville, Tenn.) 1861-186?". Chronicling America - Historic American Newspapers. Library of Congress. Retrieved 17 February 2014. ^ "Vote early for Convention and for Anti-Coercion men. ; The Crisis". Chronicling America. Gallatin (TN) Examiner, republished in Nashville Union and Examiner. 8 February 1861. Retrieved 17 February 2014. ^ Faxon, C.O. (11 February 1861). "The Papers of Andrew Johnson, Vol. 4, p. 274: The great news from Tennessee..." (PDF). Tennessee Civil War Sourcebook. Retrieved 17 February 2014. ^ "Abolitionist attempts to divest the South of the territory acquired by the Mexican War" (PDF). Tennessee Civil War Sourcebook. Memphis Daily Appeal. 7 March 1861. Retrieved 17 February 2014. ^ "Pro-Union candidate for State Senate endorsed for Robertson, Stewart and Montgomery counties" (PDF). Tennessee Civil War Sourcebook. Letter to Editor, signed "UNION NOW AND FOREVER"; Clarksville Chronicle. 22 March 1861. Retrieved 17 February 2014. ^ Gaznog, Louis (2 April 1861). "Obituary for Uncle Sam; a pro-secession argument in Memphis" (PDF). Tennessee Civil War Sourcebook. Memphis Daily Appeal. Retrieved 17 February 2014. ^ "'The negros think when Old Lincoln takes his last they will all be free.' The letter of Martha Gilbert of Robertson County to Cave Johnson Couts" (PDF). Archived from the original (PDF) on May 29, 2008. Retrieved September 8, 2007. ^ Daniel W. Crofts, Reluctant Confederates: Upper South Unionists in the Secession Crisis (1989), p.334. ^ Cooling, Benjamin (1987). Forts Henry and Donelson: The Key to the Confederate Heartland. Knoxville: The University of Tennessee Press. p. 1. ISBN 0-87049-538-0. ^ Cooling, Benjamin (1987). Forts Henry and Donelson: The Key to the Confederate Heartland. Knoxville: The University of Tennessee Press. pp. 65, 66. ISBN 0-87049-538-0. ^ "Freedmen and Southern Society Project: Chronology of Emancipation". www.history.umd.edu. Retrieved April 3, 2018. ^ "TSLA::This Honorable Body: African American Legislators in 19th Century Tennessee". state.tn.us. Retrieved April 3, 2018. ^ cited in Harcourt 2005. ^ W.E.B. Du Bois, Black Reconstruction in America, 1860–1880, New York: Oxford University Press, 1935; reprint New York: Free Press,1998, p.575.